Within these discussions she brings up the topic of quitting, particularly when the project/objective is no longer easy. In our world of instant gratification, I sense creatives quit much more often when the water gets rough or the process becomes difficult. 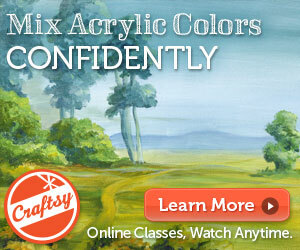 This reminds me of a homework assignment I gave to a college watercolor art class in St. Paul, MN many years ago. They were instructed to identify a subject/object that they liked or knew well, and to paint it 10 times. Their chosen subject was to be fairly simple, such as a shoe, coffee cup, an egg, a book, etc. I warned them that this was not an easy exercise and they might run into a creative “wall” and want to quit before they completed 10 paintings. Out of 25 students, guess how many actually completed the homework? Three students. The phenomenon of running into this wall is not new to me. Over the course of my 25+ painting career, it has happened many, many times. Interestingly when I slam up against this barrier, I still periodically have a conversation in my head that goes something like this, “Oh, this wasn’t a good idea.” Or “I am bored so let’s move on.” Or, “Oh, this is another failure, time to learn from this and try something else.” The excuses are endless. You do not know this, but during most of 2016 I have been experimenting with my painting as I try to determine my next artistic path. 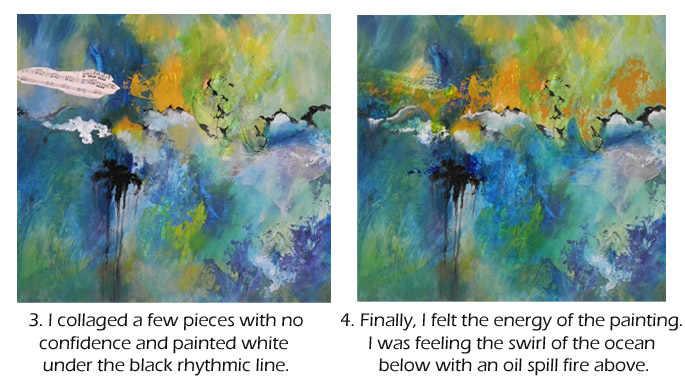 I have been copying other abstract artists – which is not easy to do – attempting to use acrylic paints with unfamiliar techniques, collaging, watching lots of videos, using mixed media and attending abstract painting workshops. Needless to say, I have run into the “Wall of Not Easy” more often than usual these past few months. I thought you might be interested in seeing one of my paintings that I did not want to pursue — a painting that I did not think I could finish with satisfaction. As I painted “Riding the Waves,” I literally had to coach myself through to the next phase of the painting couple of times. I was similar to a kicking two year old. One of my most frequent internal statements was, “Push it Carol, push it.” Sometimes I just didn’t know how to do that, but I used my persistence, faith and experience to continue. 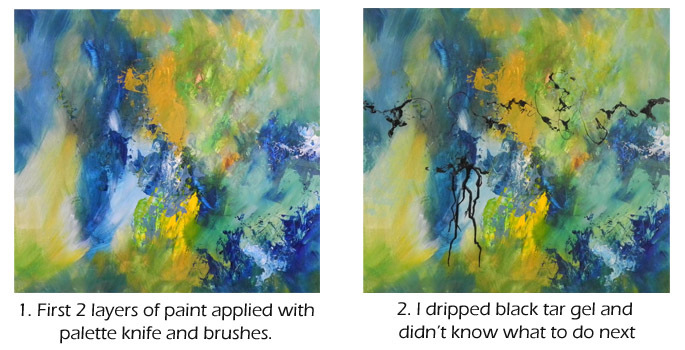 In these two photos below, you can see the first two stages of this painting. The additional challenge I was giving myself was to start a painting without any preconceived thoughts, emotions or concepts of what I wanted to paint. This is NOT how I have painted in the past. Usually, I have an idea or feeling of what I want to paint whether it is representational or abstract, before I begin. Finally, I got the idea to to add white under the black tar gel lines, as seen below in #3. BTW, this was the first time that I had used this sticky and runny stuff. For more information click applying clear tar gel. It is a bit tricky to use. I was still struggling and I did want to quit so I tossed in a couple pieces of collage. I didn’t like the results. After more self-coaching, the white under the black line did give me hope. And then I ‘saw’ the small black rhythmic shapes as little black birds flying/flitting above the blues of an ocean below. Something clicked and an emotional connection was made. From then on, I was on a roll and I could feel my creative juices flowing again. When do you quit? 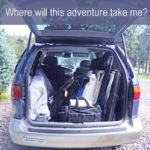 …When the going gets tough? Do you have any projects stored in your closet, computer or garage that could benefit from a resurrection? How about a poem, a book or a program that needs a good kick? 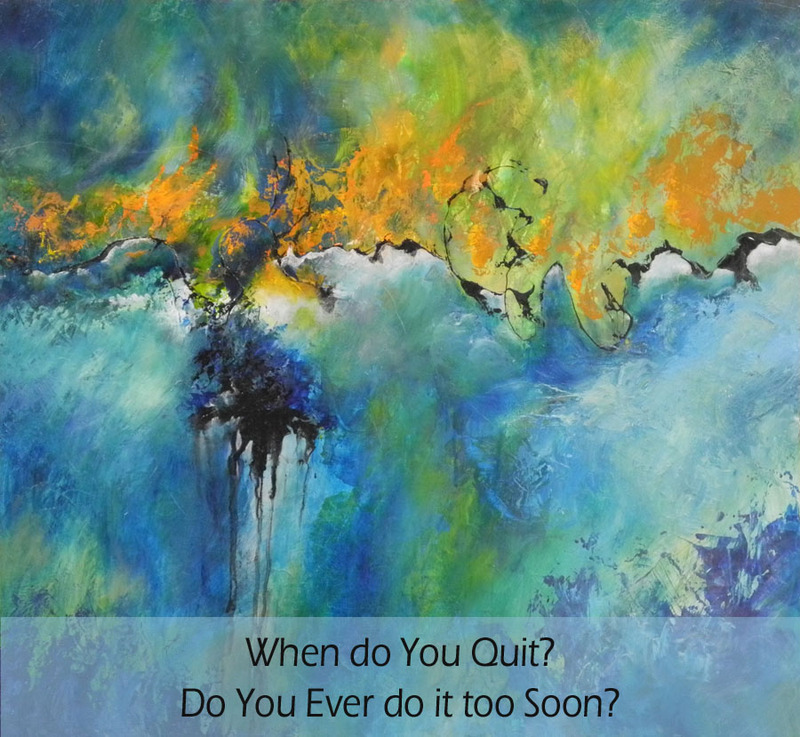 Surely, we all have quit and for various reasons. However, there are probably times when some internal or external encouragement is needed to explore your creativity. I want to cheer you on, much like Gilbert does in her book, to push through that membrane of “this isn’t easy” — to discover what is on the other side. You will be pleasantly surprised. “Riding the Waves,” 22×24 acrylic on board, was worth the extra effort and the agony of not knowing. Many people like the painting and see lots of different things in it, which I love. Another lovely result is that I received recognition from my peer group in an online juried show. They chose this painting as one of their favorites!! How cool is that?! PS If you like this post and find it helpful, I’d love it if you’d pass it on via email or social media. You can use the buttons at the bottom of this post to share it. Where Will this Painting Challenge Take Me? You are quite welcome. Thank you for your comments. It is usually worth it to plow through the sticky stuff. LOL! 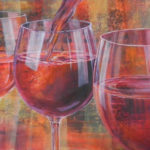 Carol, I love your painting and appreciated your process .Have started painting again with a friend who wanted to quit too I would love to send your blog to her for encouragement ..I loved your passion. 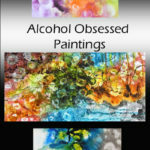 Look forward to seeing many more of your beautiful paintings .I too have started abstracts but slowly learning ! Please do not use my last name if posting comment..Thanks . Your blog is timely for me. I’ve been working on a painting that involves two trees. I was riding down a highway with my nose stuck in my iPad and looked up, into a cow pasture and saw two trees close together. One was standing, limbs broken off and dead, beautiful as it was in that condition, but the tree beside it had fallen down, but not laying on the ground as a limb held it up at an angle. It appeared it may have had a hollow part at the base like the other ‘standing dead’ tree, but somehow, it continued to live and had a large canopy of leaves from several large sized limbs. It was a inspirational moment, if not spiritual, in which the two trees met with adversity (most likely damaged in a hurricane, Rita, which was a few weeks after Katrina hit New Orleans/south Mississippi. One died, the other took strength where it could and flourished. I believe the painting has a good story to be seen. I am into my 4th drawing, making changes to keep them the center of interest but to display them best I can without simplifying them too much yet keeping the integrity of what allured me to them in the first place. Your blog tells me to keep going until I am happy with the drawing and do as many color studies until I believe their story is adequately portrayed. Thank you for sharing the Wall of Not Easy. All the re-draws and re-paintings will be worth the journey. Mary, welcome back to painting! I hope you were able to forward this blog onto your friend. Good luck with your pursuit of abstracts. 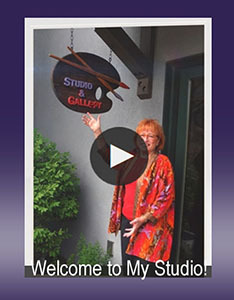 Have you looked on YouTube for demonstrations …if you are interested in video? Many more artists are posting videos. Thanks for your comment and kind words. Keep me posted.